You will earn 3,364 Reward Points. Earn 1 reward point for every 1 dollar spent. Exterior top is one-piece 22-gauge stainless steel with integral 2.12” (5.4cm) square nosing on the front. The backsplash is full width and 4” (10cm) tall. Telescoping lid is constructed of 20-gauge stainless steel. Top of drawer unit has openings to accept 18 or 24 1/6 size plastic pans 4” (10cm) deep. Top of door unit has openings to accept 18 or 24 1/6 size plastic pans 4” or 6” (10cm or 15cm) deep. Adapter bars and 1/6 size pans are supplied by Delfield. Temperature in top openings maintains 33°F (1°C) to 41°F (5°C), with pans recessed 2.5” (6.4cm) at 86°F ambient room temperature, meeting NSF 7 requirements. One 72” x 8” x .5” (183cm x 20.3cm x 1.3cm) polyethylene cutting board treated with antimicrobial agent is mounted on the top at the front edge. Dual level pan brackets allow the pans to be lowered an additional inch in the unit without tools to provide additional pan temperature holding performance. Exterior back and bottom are two-piece 24-gauge galvanized steel. Exterior ends are stainless steel. Interior sides are thermoformed ABS plastic with shelf supports. Base is fully insulated with high-density foamed in place environmentally friendly, Kyoto Protocol Compliant, Non ODP (Ozone Depletion Potential), Non GWP (Global Warming Potential) polyurethane. Refrigeration system uses HFC-404A refrigerant. Compressor is 1/2 H.P., with condenser coil and hot gas condensate evaporator mounted on rear of the cabinet. Evaporator coil is located on the interior rear wall of the cabinet. Refrigerant flow is controlled by a capillary tube. Cabinet maintains an interior cabinet temperature of 36°F to 40°F (2°C to 4°C). ACT control: ACT electronic, solid state control, mounted on the exterior rear of the cabinet, allows unit to maintain precise temperatures in heavy duty conditions. Electrical connections are 115 volt, 60 Hertz, single phase. Unit has a 6’ (1.8m) long electrical cord and NEMA 5-15P plug. Casters: Equipment is mounted on 5” (13cm) diameter plate casters with front two locking. Equipment clearance above the floor is 2.5” (6cm). 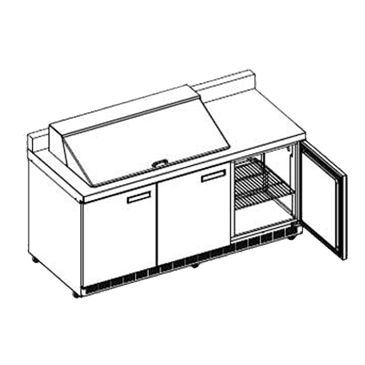 Doors have a 24-gauge stainless steel exterior, with thermoformed ABS plastic interior liner. Cabinet has one adjustable epoxy-coated wire shelf per door opening. Drawers have 24-gauge stainless steel exterior with thermoformed ABS plastic interior liner. Drawer frames are 12-gauge stainless steel. Drawer slides are 11-gauge stainless steel with Delrin bearings. Each top drawer holds one 12” x 20” (30.5cm x 50.8cm) pan and three 1/9 size pans 4”-6” (10.2cm-15.2cm) deep. Each bottom drawer holds one 12” x 20” (30.5cm x 50.8cm) pan and three 1/9 size pans 4” (10.2cm) deep. Pans are supplied by others.